Lightly marinated antibiotic-free whole chicken breast cooked slowly over the rotisserie just like you’d do in your deli department. To ensure a tender and juicy bite, we hand-shred the roasted meat while it’s still warm, chill it, then package it immediately to lock in maximum moisture and avor. INGREDIENTS: Chicken Breast, Water, contains 2% or less of the following: chicken broth, natural flavors, potato starch, and sea salt. We lightly marinate and roast whole our antibiotic-free chicken thighs, then dice and package them immediately to retain their juiciness. These succulent yet mild flavored bites are perfect for Asian stir-fry and noodle bowls or Latin American favorites such as tacos. 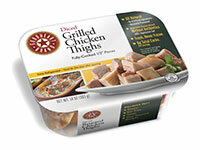 INGREDIENTS: Chicken Thighs, Water, Sea Salt, Canola Oil, Seasonings. We lightly marinate our fresh, antibiotic-free chicken breast in sea salt and water only, then flame-grill, dice and package it immediately to maintain its moisture and tenderness. 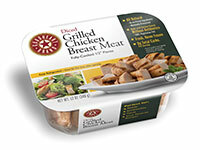 These avorful pieces are an all-natural, nutritious alternative to cold cuts for sandwiches and salads. 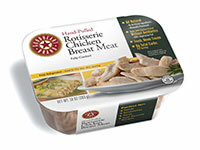 INGREDIENTS: Chicken Breast Meat, Water, Sea Salt. 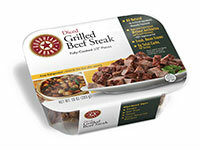 We trim flank steaks from antibiotic- and hormone-free natural beef and marinate them lightly. We then flame-grill them medium-rare, dice and package them immediately to seal in freshness and flavor. They’re equally delicious served chilled in a salad or warm in stews, tacos and more. INGREDIENTS: Beef Flank Steak, Water, Sea Salt, White Vinegar, Canola Oil, and Seasonings.